and the Open Space, the beating heart of the conference, where YOU create the content. Main stage is carefully curated selection of sessions, thinking the MyData world from different angles. Every day starts and ends with a plenary on main stage, a session for the whole conference to attend. The MyData concept is quite clear: what if people were in control of their data? It raises legal, tech and social issues. But in this track we will focus on one thing, and one thing only: use cases that truly show the power of MyData. So what is a “MyData use case” you ask? Well, a use case should involve different players: data holder, data services and of course, people. This track will focus on use cases related to those actors, demonstrating the richness of the MyData model as a paradigm shift for people in control of their data but also as a new source of innovation and business opportunities for all players. Keywords: Use cases, business models, business growth, business opportunities, transformation, value creation, benefit for consumer, benefit for citizens, personal data trade, personalised services, personal data exchange, data control. 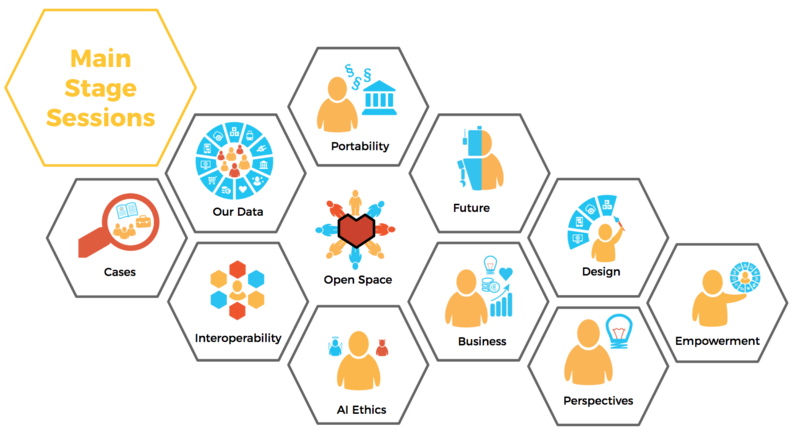 The track discusses both the ‘what’ and the ‘how’ of new data initiatives and infrastructures that move beyond the individual level to think collectively for the social good. Potential aims include fostering public good and social justice, supporting and accelerating social movements, and reinventing or bypassing dominant business models and logics of the data economy (such as requiring consent to surveillance, opt-in/opt-out models, and assuming one model fits everyone). We also seek lessons learned from data commons: the production, sharing, gathering and reclaiming of data by specific communities. Examples can come from any sector, including energy consumption, health, urban development, or finance. In addition to learning about specific initiatives, the goal is to discuss how data infrastructures and data commons work more broadly. Motivating questions include: How do emerging data initiatives and infrastructures promote innovation, social justice, citizen participation and digital dignity? What makes a particular model possible? A pre-conference workshop on Speculative Data Futures is organized in connection with this track. Our digital world is full of intentionally built walls and impenetrable wastelands of unintentional incompatibilities. We envision a future, where people have self-sovereign (not controlled by anybody else) digital identities and freedom to use their data without any constraints. What are the minimum interoperability requirements of making different personal data solutions work together in an ecosystem? We look into challenges that the builders of these solutions are facing and solving today. We hope to gain awareness of the relevant open standards and possible solutions to the big interoperability questions, like semantics of data, impact of regulations and governance of global networks. GDPR compliance requires organizations that collect customers’ personal data to provide them, among others, with a given set of new digital rights, including the right to data portability. Data portability is expected to generate tensions between the businesses need for compliance and their ability to retain customers. Technical reasons and compliance need aside, data sharing is initially probably not in the first business interest of most established companies. On the other hand, getting access to data does interest emerging businesses testing innovative ideas. New opportunities and successful business models emerge by having more data available to be used across different services – based on real portability first and later enhanced by seamless interoperability. We’re generating enormous amounts of personal data as individuals. It is obvious long time ago, that from individual perspective this commodity – “new oil”, “new soil”, etc. – is hardly ever powering or feeding any reasonable goals. Instead, it is chaining us to the current data custodians, making us vulnerable in terms of privacy and restricted in our free choice of services and goods. 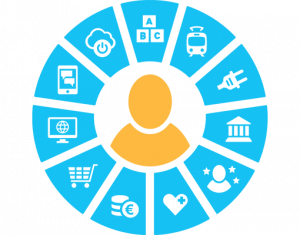 The goal of human-centric approaches to personal data is to empower individuals with their personal data, thus helping them and their communities develop knowledge, make informed decisions, and interact more consciously and efficiently with each other as well as with organisations. Providing individuals control over their personal data means data liberation for a plentitude of novel uses – business and societal, but above all, individual. Personal data liberation is a liberation of the individual. Being empowered by your personal data is not something that is handed down to everyone by magic of new legislation or generosity of a huge corporation. It entails learning about personal data, its whereabouts and availability thanks to personal rights and available technical means, its current and possible uses, but also about yourself and your calling. This will happen at the talks and hands-on workshops of the “Empowerment” track. By putting together tiny ones and zeros, we are piling up huge quantities of personal data. Quite likely, we will never manage our personal data ourselves. Indeed, we do need personal control over personal data, but an average reasonable person will soon hand this over to her artificially intelligent helper – a trusted, ethically safe helper. The experience of corporate entities “taking care” of what we see on the web, what product we buy, who are our friends and what thoughts we think, is luckily just too recent to let it slip between the lines that we factor in some ethics in our new artificial helpers. There is barely any ethical layer in the current digital domain. This track aims for raising awareness about the many nice and hard ways we need to embed ethics into the solutions we’re building for the future. Ethics needs to become more than just a nice word in the personal data talks. It needs to become a practical tool that goes beyond the transparent algorithms and decision making, to the fair remuneration of the individuals behind AI training data, and beyond. This track imaginizes what a MyData world would or could look like. What will be different, and thanks to whom? What will emerge that is currently unthinkable, what new problems and issues? Who could the key characters in these stories be? What does a “MyData world” mean for different people, in different contexts? How can the MyData vision transform specific industries and activities? We need stronger, more appealing (and not necessarily coherent) narratives for MyData, and for this we need to explore potential MyData futures. We might be looking for utopias or dystopias, but also everything in between: paradoxical, fun, desirable, messy, failed, complicated, incoherent, and ordinary data futures. For this, we will try to mix futures thinking methodologies with arts, fiction or design. The goal is to somehow feel and get a grip of the MyData futures. Will MyData be a thriving business ecosystem? The track objective is to understand the possibilities of the MyData ecosystem to become mainstream and to create significant revenue within the ICT and digital services ecosystem. We are in the early adopter phases, no doubt. What are the possible future scenarios? In the conference there will be one business track session on each conference day. These sessions build the core understanding of the emerging field of human centric personal data for the corporates, start-ups and investors. Data is a design material. Personal data is a very sensitive design material. You do not want to break it. The design topic track is exploring the emerging landscape at the intersection of design practice and personal data. It will translate the specialist discussions around personal data related design issues to the audience interested in boosting the human-centric personal data with human-centric design. What’s there behind, before, after and beyond MyData? What are we talking about when we talk about MyData? What does it mean on a conceptual, ideological level – and what does it mean in practice? What is the typical course of similar major societal shifts for businesses, governments, civil society – and of course, citizens? What historical examples are valuable for making the conscious shift towards human-centric personal data? It is imperative that MyData community takes a step beyond the everyday bustle and discusses what do the core keywords – human-centric, consent, trust etc mean when looked at from different angles. Building open ecosystems around personal data in the free world demands we make the conscious effort of closing in and agreeing on the shared concepts. This track aims to tie in the loose ends across the domain to the colourful fabric of a more balanced and trustful, fairer and better society. Open Space is where the magic happens! It is about harnessing the power of the attendees, people with various expertise, diverse interests and skills. In Open Space meetings, participants create their own agenda of parallel working sessions around a central theme of strategic importance, such as: What is the strategy, group, organization or community that all stakeholders can support and work together to create?